Rubber Room Ramblings: GREAT PUNCH CARD IDEA! 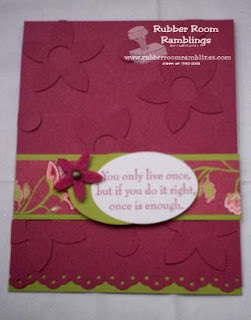 At our demo evening get together this month Linda Garrett shared a great card idea using a monochromatic color scheme with her punches, some Raspberry Tart Paper and a flower from the flower fusions. I really loved the way it turned out! I made her card with Pink Pirouette cardstock and Pretty in Pink cardstock. I used some DSP from the Tea Party pack and then just added a sentiment. At my June hostess club I am going to share this technique with my customers. This is a really easy way to get even more use out of your punches!